Okay, so Viv wasn't talking about last summer, he was pre-empting any discussion about this summer. (Last summer would be hard to beat in terms of heat records. It's already been documented that last year's summer was "unprecedented".) As for not being global - of course not. It's winter up north. You can't expect heat waves in winter. But first, let's look at the big flaw in his argument. Viv put up a gaily coloured chart modeled on the chart from the then Climate Commission (which re-emerged as the Climate Council after the Abbott Government shut it down). The difference was that the Climate Commission chart was for a single summer and showed the record heat right across the continent. Viv's chart by contrast, showed record temperatures at single locations for particular years - which varied from 1912 through to 2009. Viv Forbes thinks WUWT readers are pretty dumb. I don't blame him for thinking this. They may excel intellectually in other subjects but when it comes to weather and climate they are very dumb. HotWhopper readers by contrast know very well that you can have a record heat wave across a continent without breaking a heat record in any single locality. That's because if it's hot everywhere the the whole continent is hot (by definition). You don't have to break hot records anywhere to be hot everywhere all at the same time. Look at this map of Australia and you'll see what I mean. (As always, click to enlarge). In the great heatwave of 1896, with nearly 200 deaths, the temperature at Bourke did not fall below 45.6 degC for six weeks, and the maximum was 53.3 degC. Bushfires raged throughout NSW and 66 people perished in the heat. In 1897, Perth had an 18 day heatwave with a record of 43.3 degC. Other heatwaves were reported at Winton, 1891, Melbourne 1892, Boulia 1901, Sydney 1903, Perth 1906 and so on. 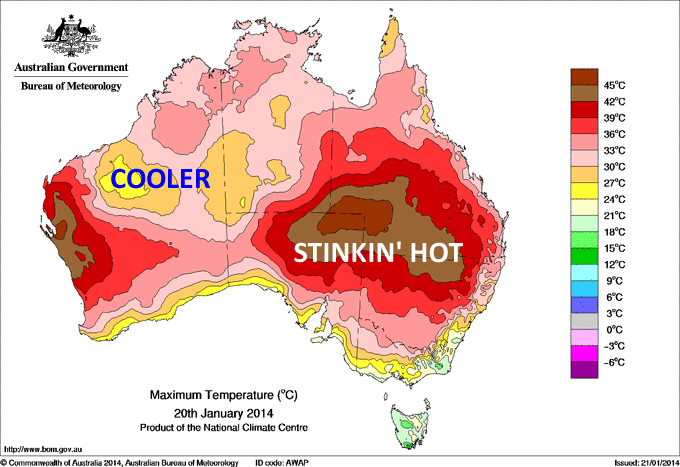 Yes, there have been heat waves in the past in Australia. However he's lying about temperatures at Bourke - see FrankD's comment below. And do you see what else he's done? Viv is trying to argue that Australia has been hotter in the past. All he's actually shown was in different years, different parts of Australia had heat waves. That's different to what we have been seeing in recent years. The national record maintained by BoM starts after Viv's last year. Just the same it's worth looking at the record and comparing early years of the twentieth century with recent years. Here's an animation showing maximum and mean temperatures for all Australia. Notice the stark difference between early last century and the last few years. For people who are not used to charts, I'll point out that to work out the difference between now and then you need to sum the minuses and pluses. Last year had an anomaly of almost +1.5 degrees and at the turn of the century temperatures were about 0.5 below zero. So 2013 was around two degrees Celsius hotter than it was in the early 1910s. That's for the entire continent for an entire year. That's a lot hotter! I hope you now see the tricks deniers play. Especially people like Viv Forbes who have a vested interest, such as keeping share prices of coal companies as high as possible. The fact he's a coal company director should have no bearing on his views on climate science. But now you know that Viv Forbes is a climate disinformer, you could be excused for pointing to his coal company directorship as a reason - but not an excuse. Viv talked about Australia's heat waves not proving global warming. Of course they don't. They are consistent with global warming. So has the world warmed since Viv's early records around a hundred years ago? You bet it has. Without doubt this AGW scaremongering is sheer poppycock. I remember many a stinking hot summer as a child in western Sydney and around 1954 where thetemperature was over 112 degrees Fahrenheit at Penrith in NSW for many days on end over the Christmas holidays at my uncles farm. I couldn't find any records for Penrith itself for the 1950s, but I did notice that Penrith hit 46.5 degrees last January (115.7 Fahrenheit). It does get hot there. Update: I found data for Richmond RAAF, which is only 18.5 km away. It wasn't hot in 1954 - temperatures then maxed out at 37.3 Celsius in December and there was no monthly average above 30C. It was a mild summer in Jan-Feb. It wasn't 1955, 1956, 1957, 1958 or 1959 either. It was cooler in the 1950s than now. I went to Observatory Hill for the early 1950s. Nope - not a hot summer in sight! This is the “anti-global warming” Govt we have in power in Australia. Yes, global warming is shite, but in my 44 years haven’t been in 4 days of 40+ degree temps & I’m in Gippsland. Friday felt like time I went to Sacramento 1999. Last week was my birthday and I was reminded by my mother that when I was born 55 years ago I came 3 weks premature, brought on by the extreme heat wave that week in Warragul (Gippsland) Victoria – 4 days above 40 degrees. Nothing new. This is an odd post – lots on temps in the past, but no numbers on the actual heat last week. It was very hot (here is my complaint at the time). Max temperatures in Melbourne for the first 5 days of the Australian Open were 31.1, 42.8,41.7, 43.9 and 43.9°C. Or, if you prefer, 88, 109, 107, 111, 111°F. Now we’ve seen hotter days. And even a longer heat wave, in 1908, where maxima were close to or above 40 for six days. But they are rare. From 1855 to 2013, Melbourne averaged 1.3 days per summer in total exceeding 40°C. For the last thirty years, the average has been 1.7. So four consecutive days well over 40 is bound to attract comment. That'll about do. You can imagine the rest. Mostly of the "I remember when" type or the climate conspiracy variation: "BoM is part of the worldwide climate hoax consortium and has adjusted all the old records". If you want to suffer more they are archived here. "In the great heatwave of 1896, with nearly 200 deaths, the temperature at Bourke did not fall below 45.6 degC for six weeks, and the maximum was 53.3 degC." Of course, the temperature did fall below that level at night; Viv clearly means the daily maxima were above 45.6 for six weeks, but lets not quibble about that. Instead, lets just observe that even with the qualification, the claim is pure fantasy. Bourke did have a hell of a heatwave in January 1896, but not like Viv's claim. Three weeks, not six. Daily maxima were all above 42.2 not 45.6. Highest temp was 48.6 not 53.3. That is remarkable enough, wihtout having to gild the lily. cnxtim, who says: "around 1954 where thetemperature was over 112 degrees Fahrenheit at Penrith NSW for many days on end "
The nearest BOM station to Penrith that was open at the time was RAAF Base Richmond, which recorded seven days over 40 degrees in the three-and-a-half years between mid-1953 (when it opened) and end-1956, with a highest of 42.2 (108 F). Never more than two days in a row over 40. As best I can tell, it is typically about 1 C warmer in Penrith than Richmond. More BS from the memory banks, even if the claim had any relevance to anything. Thanks, Frank. Prompted by your previous comment I did some digging myself and found the same. Penrith can get hot, but it wasn't all that hot back in the 1950s. The recent average monthly's are warmer now by a degree or more. There have been some very good articles on the heatwaves at The Conversation web site. I am having an ongoing battle (including a twitter campaign) with the site management over their ineffectual (one could say pathetic) moderation efforts. The site has been a magnet for cranks since its inception. I mean - where else do complete scientific numbskulls and rank science deniers get to abuse scientists? They get Australia's best scientists to write articles for them and then allow total nutters to accuse them of fraud in the comments. The current moderator who is well meaning but apparently scientifically clueless believes that is fine so long as they are polite when they make the accusation. If anyone cares to pile on, please feel free. (Sorry for the off topic comment Sou). Thanks Sou. They have lost the plot - the usual story - chasing popularity over integrity. The author of the article, Liz Hanna who is the Director of the NHMRC Project: "Working in the Heat - Health Risks and Adaptation Needs" at Australian National University was equally as shocked. Sou, as you know the division of the anomaly histograms into El Niño/neutral/La Niña subcategories shows a powerful ENSO effect. I'm not sure if it would work well on a flicker plot (perhaps you could slow the rate a little?) but it really helps to ram home the denialist fallacy of the claimed pause in global heat accumulation. The devilishly cunning aspect to BOM's cover-up of 19th century temperature records is they way they managed to change newspaper reports of the time without the liquid paper even showing up on the National Library's scanned copies! Prompted by Viv's fantasies, I went to the Sydney Morning Herald for January 1896 and tracked the heatwave in Bourke as reported there and compared them to BOM figures (which as we know are completely untrustworthy). I found a few anomalies, which I attribute to errors in reporting - for most the temperature reading seems right, but is reported for a different day - and found for the duration of the heatwave, the figures reported at the time are higher than the figures now reported by the BOM by an average of 0.004C. That's the brilliance of it you see - you make the adjustment so big that it can skew global century trends while at the same time so small that if it were any smaller it would literally be zero (changing one day by 0.1 C would zero it out). *that 108.5 F record took some beating but was destroyed by 45.3 C in the 1939 monster heatwave, which was itself beaten by half a degree last year. Here is a comment on BOM's temperature records prior to 1910 from Blair Trewin, Climatologist at the BOM's National Climate Centre. "Two reasons [for problems prior to 1910]: lack of national coverage before 1910, and lack of standardisation of instrument shelters which make it difficult to compare 19th century data on equal terms. There's been a lot of work done on 19th century observations in a project at the University of Melbourne in the last couple of years, and by this time next year we should be in a position to report on southeastern Australia back to the 1860s or 1870s, but there's almost nothing for WA outside Perth before about 1907." A bit like "The older I get the hotter it was".